The Canon PowerShot SX50 HS is a compact camera with a 12.1 Megapixel BSI CMOS 1/2.3″ sensor (6.17×4.55 mm), data is handled by Canon’s DIGIC 5 processor. The most striking feature is the lens: 4.3mm to 215mm zoom, that’s 50x. With a focal length multiplier of 5.64x that gives a 35mm equivalent of just a little over 24mm to 1200mm with a maximum aperture of f3.4 to f6.5. To make this immensely long lens viable Canon has included its Intelligent IS image stabilization rated by them at 4.5 stops, meaning that theoretically you could shoot at 1/30 and get the result of shooting at 1/750. With full HD video and a range of other enhancements: Zoom framing Assist, Smart Auto, Multi-area White Balance and High-speed Burst HQ, plus manual over-rides for pretty much everything and RAW capture too. The decider though is the price tag, which is well below others, like the Panasonic DMC-FZ150, so you can see that this is a camera that should at least make people look a little closer. Remarkably, given the price and the list of specifications, the SX50 HS scores well among its peers. The Canon PowerShot SX50 HS, highlighted in the graph is at the top of the cluster of cameras showing a good overall score, but is still relatively low on the price axis. Among the category of compact and high-end compact cameras with sub 4:3 sensors this Canon rates 10th in DxOMark’s testing. There are a couple of cheaper cameras higher up the scale, the Canon Powershot S95 and S100, but neither of these has anything like the range of zoom capability. The overall score of 47 is good. Color depth, shown by the Portrait Score and Dynamic range shown in the Landscape Score are also pretty good. Low light ISO is not great, 179 ISO is a long way behind the best in class, but it is a similar figure to most of this type of camera. 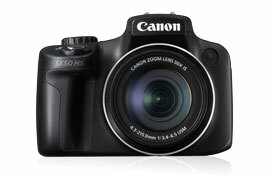 The Canon SX50 HS scores OK for low light, but in a disappointing field. SNR18% is very close: the smaller surface for the SX50 achieves the same level of noise! The G15 is equipped with a sensor 20% larger than the SX50 HS, something that the more discerning photographer might well be looking for. Yet the results for DxOMark’s testing gives the advantage overall to the cheaper camera. Color depth is 0.4 bits higher on the SX50 HS (20.3 bits against 19.9) and low light the results are virtually the same (179 ISO against the G15’s 165) Only the score for Dynamic range is just better on the G15 (11.5EV over the SX50 HS’s 11.2). The slightly higher overall score may be due to the use of a ‘Back Illuminated Sensor’ a technology that achieves more efficient use of the surface area’ would be better. There are some features where the G15 has the edge, it has a slightly larger but much higher resolution display, wider apertures, higher shutter speeds, a more powerful flash and it is smaller and lighter. However the SX50 HS fights back with its immense zoom range, a fully articulated display and a slightly faster continuous frame rate. When you consider the price too the SXZ150 HS looks very attractive. While the comparison with Canon’s own G15 is interesting, it is not comparing like with like. To do that we need to look further afield: Panasonic’s Lumix DMC-FZ150 is a much closer match. The Lumix is fitted with a lens that goes from 4.5mm up to 108mm (a 35mm equivalent of 25-600mm), exactly half the range of the Canon. However, it does have a 4x digital zoom, twice what the Canon has so the total range is the same. In many other respects the Lumix and the Canon are very similar, but there are several features where the Lumix just beats the Canon. The Lumix has a bigger display: 3” and more AF points: 23 against 9, it has a slightly higher frame rate and the ability to shoot 3D images, but otherwise the two have near identical specs. DxOMark’s testing shows that the similarity is only superficial. The Canon SX50 HS scores 47 overall whilst the Lumix DMC-FX150 scores only 40. Nearly a full bit of extra color depth, over a third of a stop of dynamic range and a similar amount of low light performance for the Canon demonstrate the all round advantage that it has over the Lumix. All of this comparison points toward the Canon as the more accomplished camera, but the big surprise is that it is also significantly cheaper, roughly 25%. This is a comparison of the quality of the data produced by the sensor, not of the lens quality but based on this alone the Lumix has quite a fight on it’s hands. The charts show that the Canon is better not just on average but across the whole range. Panasonic has launched a replacement, the Lumix DMC-FZ200. The specifications for this new camera appear to be very similar to the DMC-FZ150 and DxOMark will be testing it soon to see if it closes the gap with the PowerShot SX50 HS. It will still retail at a higher price than the Canon so it will need to be good to beat it. The question that cannot be answered based on the DxOMark testing for camera sensors is whether the lens fitted to the Canon SX50 HS lives up to the very capable sensor. Based on the data however, it would be a big mistake to overlook this camera. The creative possibilities available with such a wide range zoom lens: flattening perspective, shooting wildlife and sports, travel and landscape: let’s face it, pretty well any kind of photography make it an enormously versatile package at what appears to be a very reasonable price.